Feltman to Siniora: "You country is really strange; it’s even stranger than when I left it!" 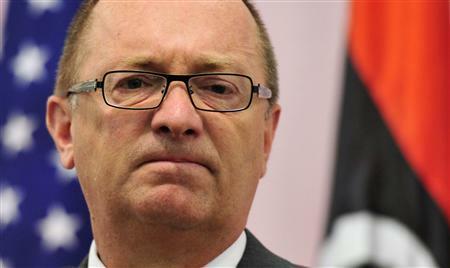 “…Jeffrey Feltman, started the meeting with the Syrian crisis, and was careful to explain the position of his country, saying: «We have no appetite for a military operation in Syria, we do not believe that the military action is wise; because it will benefit the Syrian regime and the Iranians who in reality, will drag us to THEIR fight!. As to our aid to the insurgency, this is another issue, whether through humanitarian aid or non-military equipment, I do not know at this time. But we have to be flexible in determining the issue of non-military gear, and must move more to persuade countries that may exert pressure on the Syrian and Iranian regimes, and on Russia, China & others ».The U.S. official added: «For China, there is the possibility to have pressure exerted by Gulf Arab countries; because Beijing needs energy supplies and consumer products. You must keep the pressure on the country. I sense that the Chinese might respond to pressure. Secretary of State Hillary Clinton is there now, and the Syrian file tops her agenda, … the Chinese are not ‘militants’, like the Russians ».Here, Feltman asked Prime Minister Fouad Siniora: «What is your advice for our approach to the Russian position? I heard that they do not care about the fate of the (Syrian President) Bashar al-Assad, that it’s all ‘interests’….. ». Siniora replied: «I have told the Russians they are the only country in the region who can remove Bashar…. We have reminded them that, in our region, we are usually used to burning the American flag, and today we have Russian flag burnings, ….».Feltman: «It appears that you do not have enough Russian flag burnings….